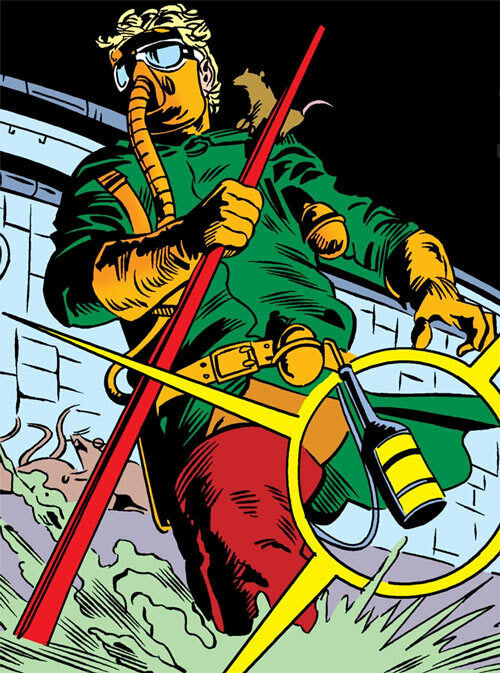 The Ratcatcher is a slightly obscure, but oddly memorable, Batman villain. He first appeared in 1988. As time went on, he arguably become more of a Robin villain. The entry has various drawings of aggressive rats, in case somebody’s phobic about that. Height: 5’ 10” Weight: 160 lbs. Flannegan is an insane murderer and would-be mass murderer, but not a hardened combatant. He will fight hard at first, but if he sees the fight is lost and he can’t escape, he’ll surrender. He’s also liable to panic and make mistake if met with overwhelming force. 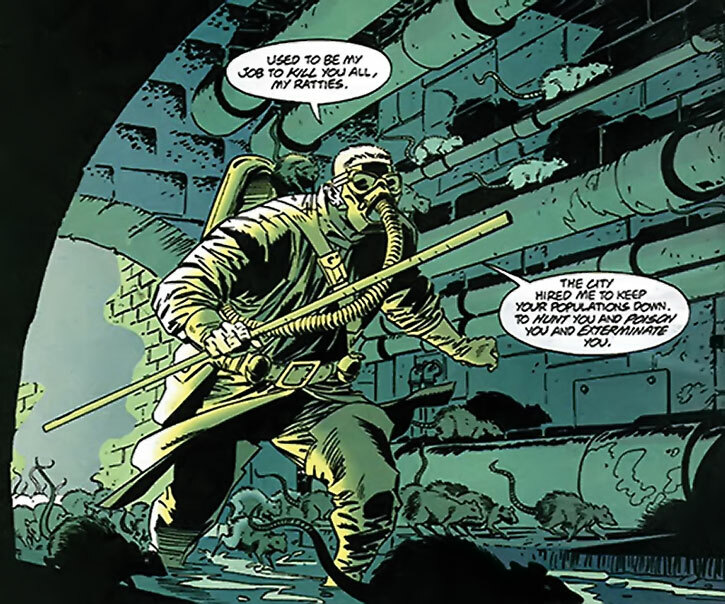 Given his experience, he possesses a detailed knowledge of Gotham City’s sewer network. He’ll use as a weapon – for instance by using valves to flood tunnels. The Ratcatcher is also surprisingly fleet and sure-footed. In DC Heroes RPG terms his Acrobatics Skill doesn’t mean back-flips and somersaults, but rather the rat-like ability dash, dodge attacks, rapidly climb obstacles, run along narrow ledges, manoeuvre in confined environments, etc. He can also deliver surprisingly accurate attacks from time to time. In game terms this is using Hero Points for AV when least expected. Flannegan has a unique rapport with rats. These act in a particularly loyal and helpful way toward him. This ability deepened as his insanity developed. It eventually became something that is presumably a superhuman ability. Ratcatcher became able to convince rats to execute on complex plants, even if that involved suicide for individual rats. When he rants and raves rats obviously understand what he’s saying. They react as if he had great charisma. Later on, rats could report to him and somehow convey what they had observed. This superhuman level of communication might only be feasible with rats who have decided to be his followers, though. That an OMAC unit once targeted him might be a confirmation that Flannegan is/was superhuman. Otis Flannegan was an unusual sewer worker, working for the Gotham City Sanitation Dept. 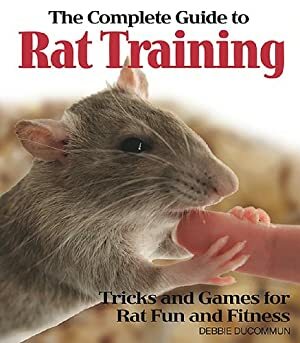 He claimed, to general indifference, that he could train rats. He also had a mean, vicious temper. As a consequence, he knifed a man to death during a brawl. His opponent had told him that he stank. Flannegan spent ten years in prison. Once he was released, he established a base in the sewers. From there he kidnapped the main persons who had condemned him. This included the judge, the star witness and the arresting officer. He kept them in horrible, squalid cells and only fed them dead rats for five years. The judge eventually escaped, but was killed by Flannegan’s pet rats. This attracted Batman’s attention. After disposing of the rats with a gasoline tank and a torch, the vigilante took Flannegan down. The psychotic sanitation worker was condemned to 20 years this time. Flannegan knew that his first parole hearing would not be favourable. But it would provide him with an opportunity to escape. During the hearing he produced a small flute that he had crafted in his cell. He used it to summon numerous rats to invade the premises. Batman (Richard Grayson) and Robin (Tim Drake) intervened, to no avail. After the rats stalled them, the dynamic duo counter-attacked. They released in the sewers a half-dozen rats equipped with miniature radios and batteries. One of these joined Flannegan’s rodent army. Thus, the vigilantes located the murderer. 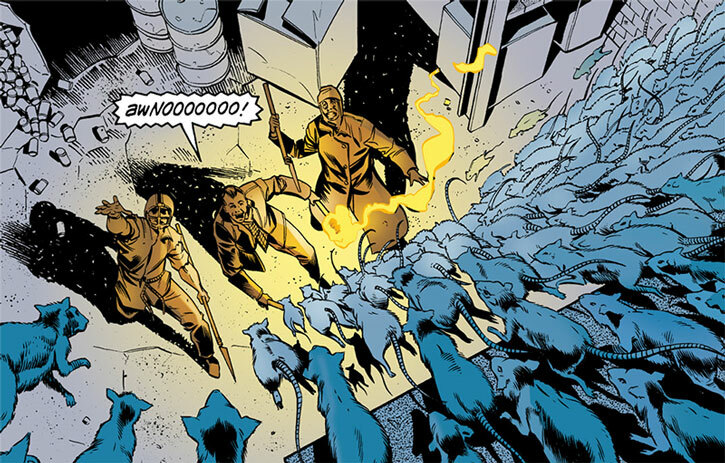 Batman took down the Ratcatcher, dispersing the rats with a high-powered ultrasound emitter. In Blackgate, Flannegan’s good behaviour gave him library rights. He read all he could about selective breeding so as to create better rats. He also became a gopher for the prison’s doctors, and taught rats to navigate the prison. His educated rodents could bring messages and small items to specific cells and rooms. The “rat messaging” system became an important part of Blackgate prison life. Howbeit, Flannegan lacked the assets to leverage this into actual power. Then, Flannegan met the dreaded Bane. The master criminal was mentally and physically very diminished by Venom withdrawal. 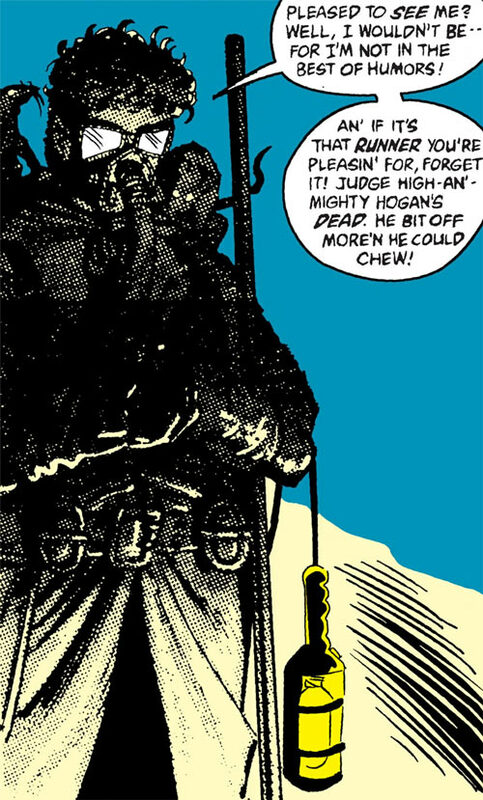 Nevertheless, the Ratcatcher felt honoured to know the man who had broken Batman and offered his services. Flannegan provided Bane with the intelligence — particularly a tidal chart of Gotham City’s harbour — that he needed to break out. He also helped Bane escape from the infirmary. Flannegan eventually escaped himself. He left rats in his bed to delay the discovery of his disappearance. Then he started breeding stronger, smarter rats. The Ratcatcher also organised a new army of rats. These robbed pharmacies to eat all sorts of toxins, then infiltrated the drinkable water reservoirs. They died in there, in order to exterminate humans through their poison-saturated corpses. Flannegan promised the rats that their “names as martyrs” would be remembered in the “rat scrolls of honour”. 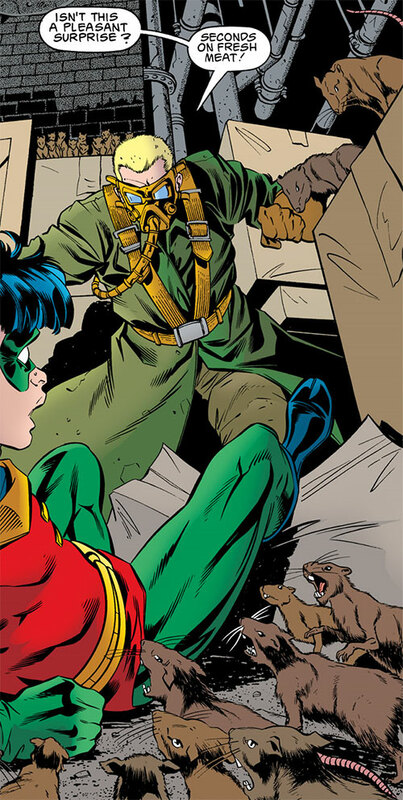 Ratcatcher’s efforts were foiled by Batman (Richard Grayson). 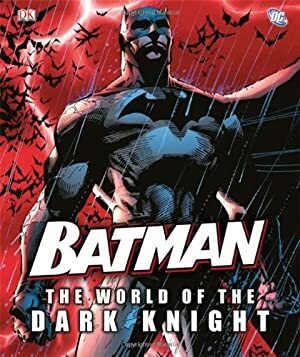 That came after the Dark Knight accidentally received the help of Catwoman, the villainous Catman (Thomas Blake) and two panthers tamed by Blake. The most intelligent rats bred by Flannegan fled when they saw that Batman was electrocuting the other rats en masse. Then the rat was arrested by the bat. When Gotham City was hit by an intensity 7 earthquake, a number of convicts escaped from Blackgate. Flannegan decided to cast his lot with the former Cluemaster (Arthur Brown) and his allies, including Titus Czonka and Monsoon. That was even though they had previously treated him quite poorly. The group ran into Huntress (Helena Bertinelli) and Spoiler (Stephanie Brown), and Ratcatcher was kicked unconscious by Spoiler. However, he recovered in time to escape. The increasingly crazy Ratcatcher decided that the earthquake was divine retribution against man. He thought that he and is rats would finish the job. His attempt to have his rats attack a subway car trapped underground was thwarted by Batman (Bruce Wayne) and Robin (Tim Drake). They forced him to show them a way out of the collapsed subway tunnel so they could rescue the passengers. Flannegan was again thrown in prison. However, he was soon released (or escaped) when the city was declared a no-man’s-land . Flannegan was one of the many gothamites who chose not to evacuate. He returned to the sewers, as the post-quake environment was ideal to establish a rat kingdom. The Ratcatcher and his rat army took over a number of underground food caches by killing the quake survivors controlling them. The strategy was to eat everything, breed, then storm the ruins of Gotham. 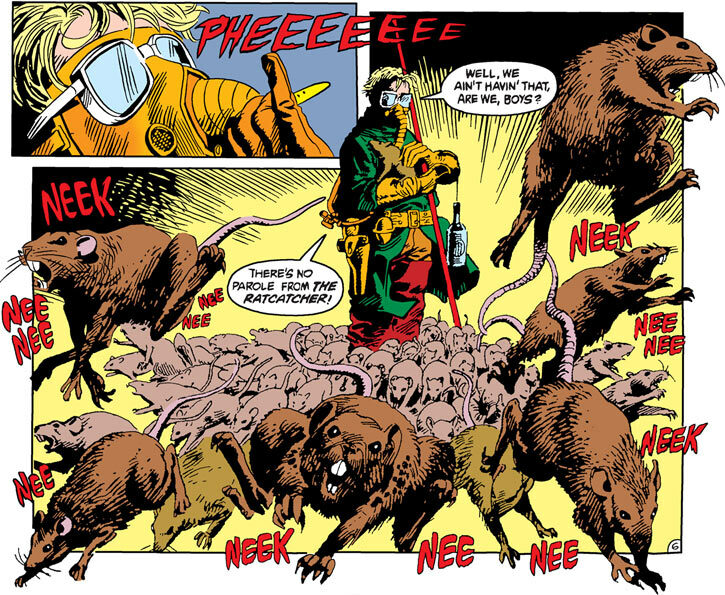 Robin (Tim Drake) tried to stop him, but was forced back by the rats. Drake might have died from infection but was saved by a community of adolescent survivors. 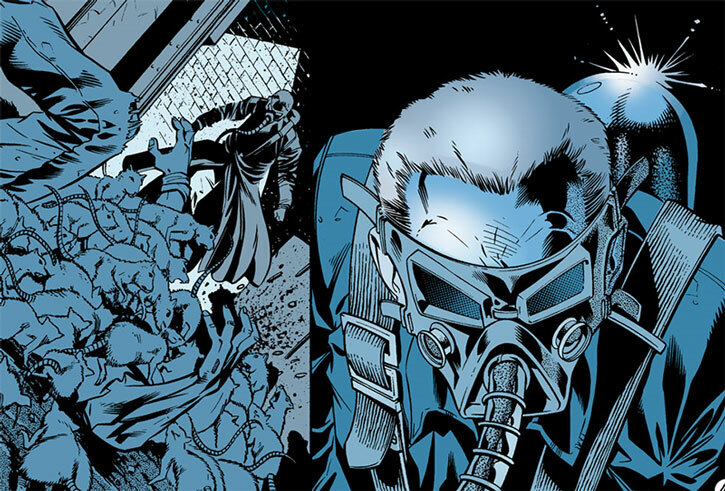 By the time Robin came back, Ratcatcher had been forced to serve as a guide by the far more powerful Mister Freeze. The two villains were stopped by Robin. They were then arrested by the Blue Boys, the ex-police gang. 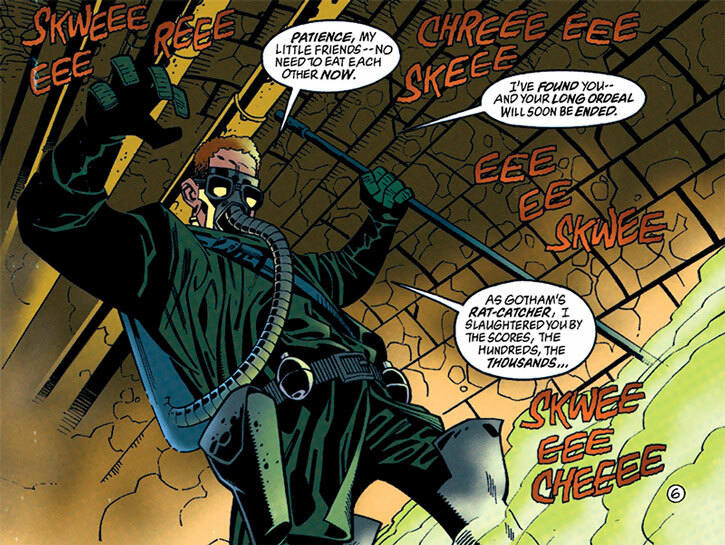 The Ratcatcher hasn’t been seen much since the earthquake in Gotham. 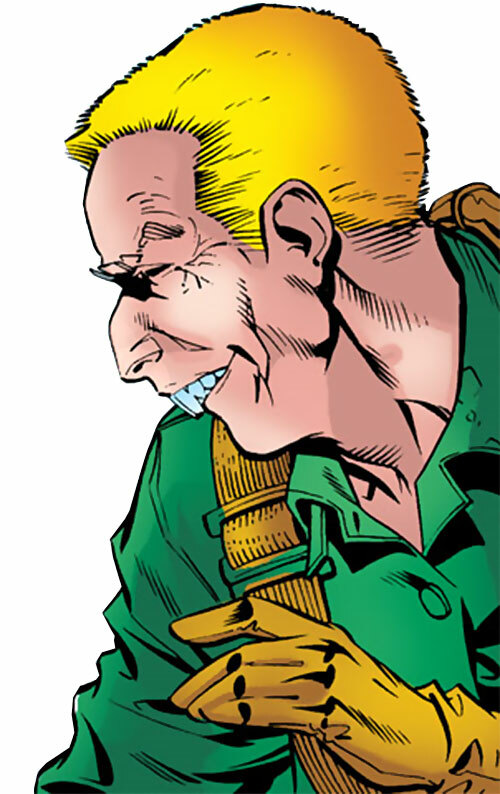 He was briefly mentally manipulated by Manchester Black, as were a score of minor villains. That was part of a far-ranging revenge plot against Superman, but was easily stopped. A few years later, during the Infinite Crisis , Flannegan was apparently incinerated by an OMAC unit. Flannegan’s two front teeth have grown over time, to resemble rat teeth. While this is probably artistic licence, there’s a troubling correlation between this, his claims to now be more rat than human, and his superhuman ability to communicate with rats. Originally, Ratcatcher was out for revenge against society. He was incredibly bitter over having been arrested for murder. Flannegan considered that society owed him for having worked so hard to ensure its comfort. In fact, he even claimed the authority to kill in the name of the Sanitation Department ! He was cruel, vengeful and saw himself as being justified no matter what. Flannegan’s sanity continued to erode over the years. That may have been a consequence of the lack of social contact – though he talked a lot, the only listeners were rats. He developed a guilt complex over having killed so many rats as part of his job. Though he previously considered that his job meant that he should be treated with great privilege, he came to consider it as a grave sin akin to mass murder. He thinks that he needs to save enormous numbers of rats to find redemption for his crimes, preferably by devastating the surface world. Thus, Ratcatcher came to consider that “his boys” (more rarely his “babies” or his “children”) were better than human beings and should replace them. He came to develop plans to conquer Gotham after having driven out the human population. Ottis felt that his “authority” over rats held immense power. Thus, he came to consider himself a great general to a potent army, ready to order mass sacrifice if necessary to inherit the world. As his mental condition continued to deteriorate, Flannegan came to consider that he had been transformed by his subterranean lifestyle. In his view, he had become more rat than human. He is now on a literal first-name basis with many of his rats. Ratcatcher hates it when a rat, and especially a rat he knows, gets killed, but taking rats hostage would presumably not work. There might be a connection to Willard Stiles. Speak with animals is Limited to rats (-2). Area Knowledge (Gotham sewers – three hundred miles of drains and aqueducts and steam tunnels), Expertise (Rats, Selective breeding). Creepy Appearance, Minor Rage, Minor Psychological Instability. Gas Mask [BODY 03, Shade: 01, Sealed systems: 06]. Whistle [BODY 02, Animal summoning (Rats): 05, Note : Can be used when the gas mask is on – there’s a slit that can be opened near the mouth]. Sewer lamp [BODY 01, Flash (Steady illum. only): 03]. Sewer pole [BODY 05, EV 02 (04 w/STR)]. Saturday Night Special .38 revolver [BODY 03, Projectile weapons: 03, Ammo: 06, R#04]. Cyanide gas pistol [BODY 03, Fog: 01, Poison touch: 04, Bonus: Poison touch is Combined With and Active Throughout the Fog, Bonus: Autofire, R#03]. A pistol-shaped projector attached to a steel tank filled with poison gas. A good blast might well kill an unprotected person, and the gas will linger on in unventilated environments – which is usually the case underground. 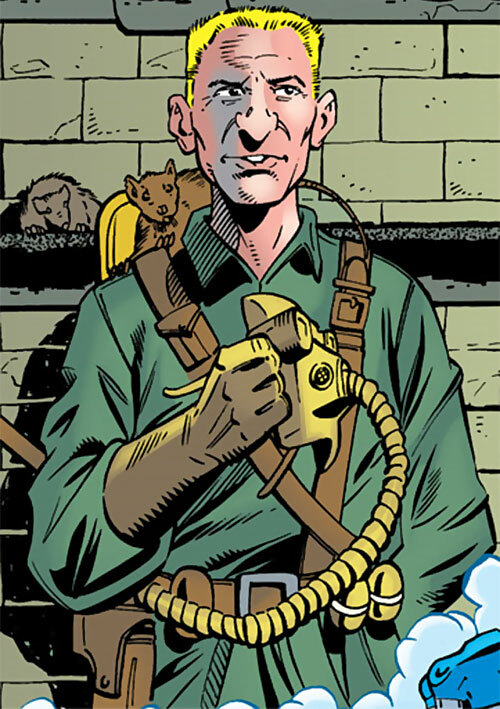 Ratcatcher employs single rats as scouts and the like. See our Animals File for the stats of one of these lovable critters. Ratcatcher’s rodents live deep underground, and like most subterranean animals are afraid of fire and bright lights since it’s so alien to their experience. They will reliably decamp when exposed to strong sources of light/fire. There are usually a few rats on Ratcatcher’s vicinity – and/or who have climbed on him if they feel like it. These rats will attempt to protect Flannegan. In game terms this is the usual LDD or some OV/RV enhancement on Ratcatcher’s part, but this manifests as a rat attacking the person or object attempting to harm the Ratcatcher. More commonly he’ll have rats operating in large units. These are well able to kill a human being. Here are the stats for two common kinds of swarm. Shrinking is Always On and already taken into account. Most attacks can only score one RAP. Scattershot and Autofire can score 2 RAPs. Multi-attacks can score as many RAPs as they have targets. Flame and area effect attacks can score full RAPs. Minor Physical Restriction (red color blindness), Minor Physical Restriction (very near-sighted — anything more than 0 APs away is blurry). Being clawed at and bitten by masses of rats in the sewers can have unpleasant consequences. Any character thus damaged (even if the RAPs are LDD’d) will likely undergo medical problems. Howbeit, being current on vaccinations (particularly tetanus) and a solid dose of antibiotics will normally prevent a healthy subject from dying. AVs/EVs (tested against BODY/BODY) and whether they are Bashing or Killing is way too dependent on vaccines, medications, general health, severity of wounds and exposure to infection, when and how the wounds are cleaned, the Genre, etc.. Thus, it may be best handled on a case-by-case basis. Ratcatcher studied animal breeding and intelligence. He worked on developing more powerful rats – in particular by creating amino acid diets. His enhanced rats are reportedly 50% bigger and much more intelligent. At least for a while, he was obsessed with the idea that he could develop “rattus sapiens”, an uplift with human-level intelligence. These rats have one less AP of Growth, and one more AP of INT. They count as Pets, showing a high level of initiative and coordination. A typical example is that when attacking Batman, some of them were distracting him so several could chew his utility belt off. However, they were smart enough to look out for number one, and abandoned the Ratcatcher rather than be futilely massacred defending him. Flannegan thought that he had made enough “rattus sapiens” rats for them to teach and lead other rats. Whereas he was right remains unrevealed. Helper(s): Roy Cowan, Chris Cottingham. Writeup revised on the 26th of June, 2011.